A new 665 kilowatt turbine is installed next to the original 225 kilowatt turbine at Camp Williams. Photo by Mike Vanden Berg. There is another energy section in town at the Utah Geological Survey! The State Energy Program (SEP) was recently relocated to the Survey and, after a brief transition period, is ready to provide funding and support for energy efficiency, energy conservation, and renewable energy efforts in the state of Utah. We are excited to be a part of the Survey and to continue to promote clean and efficient energy options for Utahns. During the 2005 General Session of the Utah State Legislature, S.B. 199 dissolved the Utah Energy Office and divided its functions across a handful of state agencies. The legislation relocated the SEP and the Renewable Energy Tax Credit program to the Utah Geological Survey. S.B. 199 also transferred the Clean Fuel Vehicle Grant and Loan Program to the Division of Air Quality in the Department of Environmental Quality. In separate administrative actions, the State Building Energy Efficiency Program was moved to the Division of Facilities Construction and Management, and an energy policy position was established directly within the Governor’s office. SEP is the state interface with the U.S. Department of Energy (U.S. DOE) State Energy Program and provides a funding opportunity for energy efficiency, energy conservation, and renewable energy initiatives in Utah. The SEP typically receives between $425,000 and $450,000 in formula grant funding annually. This amount is determined by the level of SEP funding that U.S. DOE receives from Congress, and by the population and energy consumption of each participating state. To qualify for federal support, the SEP also receives matching funds from the State of Utah. Some of this funding is made available to energy conservation and renewable energy-related organizations through a competitive bid process at the beginning of each calendar year. In addition, SEP serves as the point of contact for businesses and organizations to receive funding for a variety of special energy projects that are selected and supported by U.S. DOE each year. The mission of the SEP is to provide direct support and access to federal funding for energy efficiency, energy conservation, and renewable energy programs and projects in the state of Utah. To accomplish this mission, SEP administers several programs either directly or with the assistance of its valued community partners. 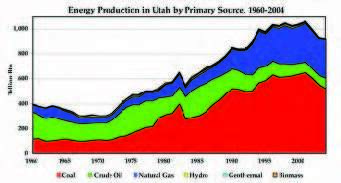 In 2004, renewable sources constituted only 1.6 percent of energy production in Utah. 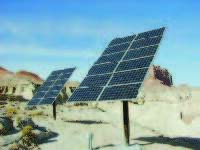 The SEP works through a variety of programs to help diversify Utah’s energy resource mix and to encourage the development of renewable energy in the state. 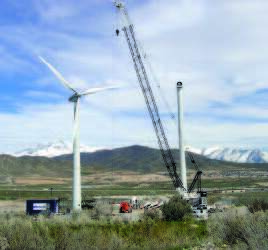 The SEP works with Utah Clean Energy to sponsor the Wind, Geothermal, and Solar Working Groups. These groups provide forums for parties interested in the advancement of renewable energy resources in Utah and focus on ways to eliminate or reduce regulatory, institutional, and market barriers to renewable energy development in the state. The SEP also administers the Utah Anemometer Loan Program, which provides interested land owners with 20- and 50-meter meteorological towers with which to assess the wind resource on their land. The anemometer data can be compared with the projected wind resource information used to develop the Utah Wind Resource Map. This comparison establishes a better understanding of Utah’s wind energy potential and, ultimately, can help encourage wind power development in the state. Energy efficiency and conservation measures have been identified by Utah Power and others as one of the most cost-effective sources of “new” power for the state of Utah. The SEP works with several partners to encourage the adoption of energy efficiency and conservation strategies in all sectors of Utah’s economy. In the spring of 2005, the SEP – in conjunction with partner Utah Clean Energy – initiated the Utah Energy Efficiency Working Group (EEWG) to serve as a focal point for energy efficiency and conservation efforts in the state. The EEWG includes representatives from utilities, large energy users, non-profit organizations, and other entities interested in “doing more with less” energy in Utah. The SEP partners with the National Energy Foundation to sponsor the Utah Energy Smart program, which provides K-12 teachers and their students with energy education materials. The program goals also focus on building strong alliances and partnerships, conducting and participating in events for teachers and their students, maintaining strong implementation programs in school districts with energy management action plans in place, and conducting large-scale energy awareness activities and energy education efforts for the general public. According to U.S. DOE’s Energy Information Administration, the transportation sector consumes over 29 percent of all energy used in Utah. The SEP works with its partners, including the Utah Transit Authority and the Utah Clean Cities Coalition, to provide ride sharing, alternative fuel vehicles, advanced vehicle technology, idle reduction, and energy efficiency programs in Utah. These options can help reduce the amount of energy used in transportation and can help reduce the impacts of increasing fuel prices on Utah’s citizens and businesses. The SEP also maintains an energy and minerals trends Web site, which provides detailed information on reserves, production, consumption, and prices for Utah’s citizens and policy- makers. The data are available for easy viewing and download on the Internet using common file formats at www.energy.utah.gov. This information helps SEP understand the need for and impacts of various energy efficiency, energy conservation, and renewable energy initiatives. The SEP staff consists of Denise Beaudoin, Partner Coordinator; Nykole Littleboy, Renewable Energy Specialist; Michael Vanden Berg, Geologist/Energy Data Specialist; and Kim Mellin, Web and database specialist. For more information on the UGS SEP and its programs, please contact us at 801-538-4798 . Glad You Asked: What Mountain Range Honours Prominent Geoscientists?